Pay only $459 for Teeth Whitening & Save $340!!! All the smiles you see on this page are smile makeovers created by Dr. Hoffenberg and his team. They are real patients, not stock photos or models. Please take a moment now to browse thru these photos and case studies. If you would like to schedule a Free Smile Assessment with Dr. Hoffenberg, you may fill our the webform below or call his office directly at 02 8599 7107. Dave was very unhappy how his upper front teeth completely covered his lower teeth when he closed his mouth, after years of wearing his teeth down from grinding. He really hated his smile. We designed a new smile for Dave using 6 upper and 6 lower natural looking all-ceramic crowns. All work was completed in just 3 visits and he is absolutely thrilled with the result. Jim was referred to Dr Hoff by a dental colleague. He had a lot of decay around old crowns and his remaining teeth were completely ground down making it difficult to eat. He also hated his smile. Jim required a full smile design makeover to improve his function and his smile. This involved very careful planning, which included establishing a new comfortable bite and 28 new porcelain crowns. Cat hated her smile and her uneven wobbly upper teeth. She was not sure how to fix this and was desperate. When she attended my practice for a Free Smile Assessment we discussed her options. We designed an affordable plan to get her mouth healthy and give her a great smile which involved removing the bad teeth and making her a precision fitting partial denture to match her own teeth. Ven attended my practice concerned that his teeth have worn down due to years of grinding and he was finding it difficult to eat. He was worried that he might lose his teeth. We designed a new bite for Ven using a combination of cost effective composite crowns on his back teeth and porcelain crowns on his front teeth which took just 6 weeks to complete. Sam came to see Dr Hoff because he had ground his teeth down so much that he could not eat properly and he was too embarrassed to smile. He chose TLC Dental because of our great reviews. We built up Sam`s back teeth with strong composite fillings and created a new smile with 14 very natural looking ceramic crowns. This was an affordable and cosmetic option for Sam. He is delighted. T had gum disease, his teeth were crooked and were worn down due to grinding and he knew that he really needed to do something to save his teeth. He was also self conscious about his smile. First we treated his gum disease, then T had orthodontic treatment to correct the position of his teeth and then Dr Hoff completed his new smile with only 4 ceramic crowns on his upper front teeth. She did not want Invisalign. We were able to design her smile with porcelain veneers and crowns, in only 3 weeks. Her confidence returned and she was really happy. This patient wanted to improve her smile, but she did not want to wear unsightly fixed braces. She had heard of removable invisible braces and wanted to explore this option. 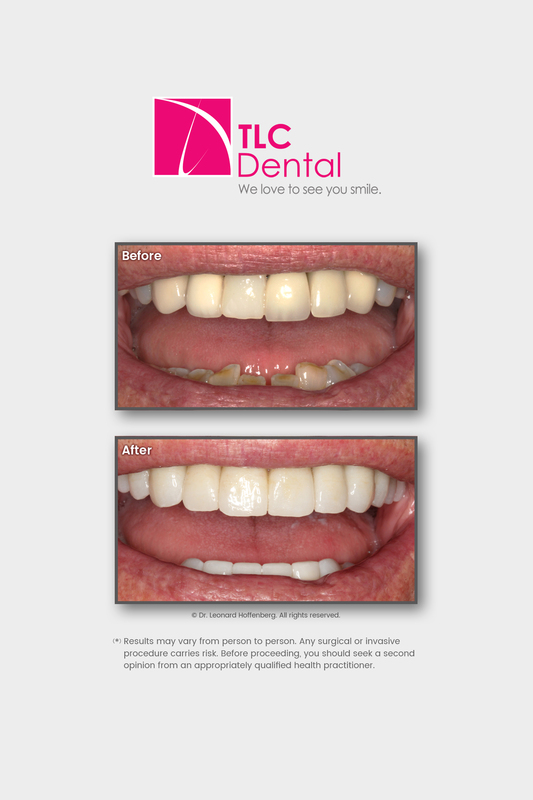 We were able to do Invisalign Lite treatment which took only just over 4 months. She was very surprised at how quick it took to straighten her teeth and super excited with the result. This patient has a very deep bite. His teeth had become very thin and pieces were chipping off. His teeth were also full of old discolored fillings that were breaking. He was in real danger of losing one or more of his four front teeth. The old broken fillings were removed. Four porcelain crowns were placed to both protect his teeth and greatly improve his smile. His bite was then adjusted to reduce the contact of his lower teeth on to his upper teeth. This patient hated her smile, especially the `pushed back` second from front tooth and the fact that you only really saw her 2 front central teeth when she smiled because her upper arch was too narrow. We did Invisalign. We brought her `pushed back`tooth more forward in line with her other teeth, and we widened her arch to make the rest of her front teeth more visible and to give her a more prominent smile. These were subtle changes that made a huge difference, and importantly we gave the patient exactly what she wanted. This patient`s front teeth chipped over time due to some old bad habits. They were also becoming quire sensitive to cold. Only three front teeth were affected. Porcelain veneers were placed on to the three damaged teeth only and they were matched to the remaining healthy front tooth. This was difficult cosmetically because it was important to match the porcelain exactly to the remaining front tooth to make them look as natural as possible. The patient was extremely happy because of our conservative approach and fantastic result. This patient was extremely nervous after having a really bad dental experience several years ago. He hated his very chipped front teeth and the colour of his teeth. He was also told previously that nothing could be done about his chipped front teeth. Then he was referred to our practice by his wife who is a patient here. 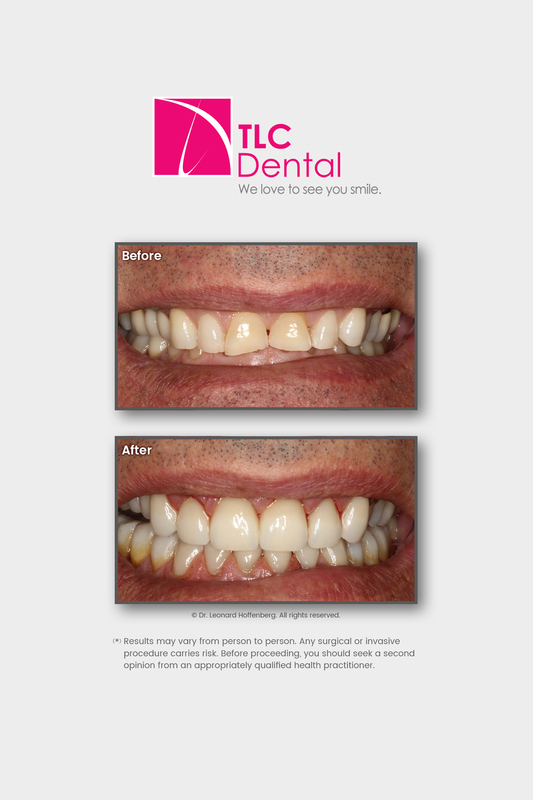 After being reassured and made to feel comfortable he decided to have Natural+ in-chair teeth whitening and four Emax ceramic crowns placed on his front teeth and he was delighted with the results. This patient ground down or damaged most of his teeth over time. He was also very unhappy with the shortness of his front teeth. Treatment involved porcelain/ceramic crowns on all his teeth and a dental implant on an upper front tooth to reestablish a healthy mouth, plus some gum recontouring to increase the length of his teeth. The result is strong, healthy teeth and a very pleasing smile. This patient was unhappy with the color of his teeth and was interested in a fast teeth whitening solution that would look natural. The patient underwent NATURAL+ Teeth Whitening. A revolutionary new system, NATURAL+ can whiten your teeth up to an amazing 6-12 shades in about an hour*. 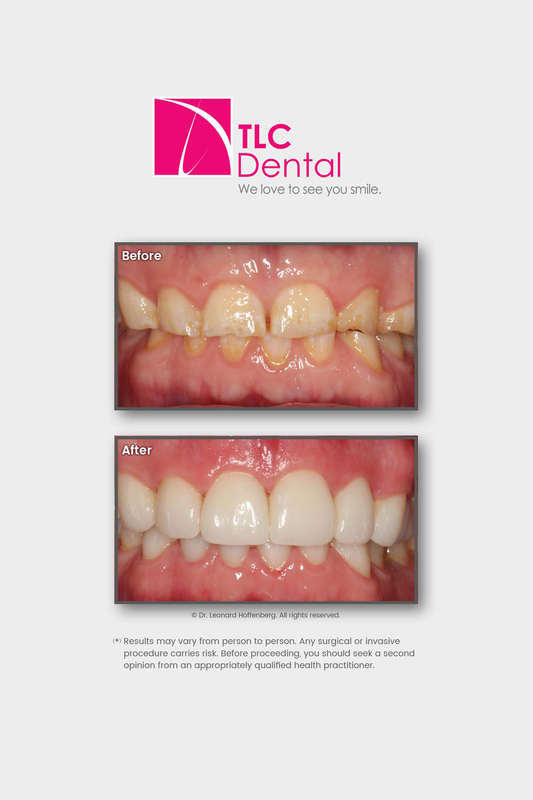 These aesthetic results make this the ideal “lunchtime treatment” for your teeth!” As you can see the results are fantastic and the patient was extremely happy with the outcome. This patient had lost the teeth on the entire left side of her upper jaw and was finding it very difficult to eat, not to mention the embarrassment whenever she even just opened her mouth. She also had an existing porcelain bridge on the right side which she hated due to the darker colour. She was desperate to be able to eat properly and to smile again with confidence. Another problem was that she was very nervous due to bad past dental experiences. Treatment involved placing 4 implants in the left side of her upper jaw, fitting a permanent fixed implant supported bridge to give her teeth again, and replacing her discoloured existing bridge with a brand new porcelain bridge that matched her new teeth on the left hand side. The result is one very happy patient who can eat anything she pleases , is smiling again and has regained her confidence in dentists. This patient who is a high powered executive had worn his teeth down from excessively hard brushing over a long period of time. The result was deep gouges in his teeth which had become stained, and obviously affected his confidence when smiling. He had actually trained himself to smile without showing his teeth. Composite (white filling) veneers were bonded to his teeth and shaped and then highly polished to look extremely natural. He was absolutely delighted with the result. All her teeth were extracted, some bone grafting was done, and 6 implants were placed in her upper jaw and 5 implants were placed in her lower jaw. Hybrid dentures were made and securely screwed on to the implants so that they were fixed and could not move. It is called a hybrid denture because that is what it is- a hybrid. It is made of acrylic material like a denture but it is thin and comfortable and has the shape of a bridge. It is also much more affordable than a pure porcelain bridge, has less chance of chipping than brittle porcelain and it looks fantastic. This patient had a really bad bite and very worn upper front teeth which resulted in what we call a reverse smile. This was really visible when he opened his mouth. To help my patient to achieve his goals I put together a treatment plan which involved orthodontic treatment. His bite was so bad that it was suggested to the patient to have some jaw surgery to reposition his jaw prior to the orthodontic treatment, which understandable he declined. As an alternative I designed his smile using porcelain crowns after completion of his orthodontic phase of treatment. He was absolutely delighted with the result, as was I. This patient requested a smile make-over to close the midline gap and reverse the crossbite on her right side. As her gum line was very uneven, we straightened her gum line and lengthened the short appearance of some of her teeth with cosmetic recontouring. Tooth whitening helped whiten her teeth and ceramic crowns and veneers were placed on eleven teeth to achieve the desired and successful result. This patient lost his upper left canine (eye tooth) due to severe decay and a fracture. His upper and lower front teeth were severely worn down due to several years of grinding. In addition there was crowding of the upper front teeth. His missing tooth was replaced with an implant and an all-ceramic crown. The other teeth were restored with empress (a form of ceramic which are bonded to teeth) crowns and veneers, which greatly improved aesthetics. This patient had an existing crown-supported by a post on a root canal treated tooth. The crown had a history of falling out and it was found that there was a hairline fracture on the root. The tooth was removed and a implant was placed in this area at the same visit. After approximately ten to twelve weeks a permanent crown was placed and fitted onto the implant. This patient wore down his teeth completely due to excessive grinding and drinking lots of sugared drinks. He also had severe gum disease. He was in real danger of losing all his teeth. Treatment included periodontal (gum) treatment to treat the gum disease, and rebuilding almost all his teeth, followed by Porcelain/Ceramic Crowns and Veneers. 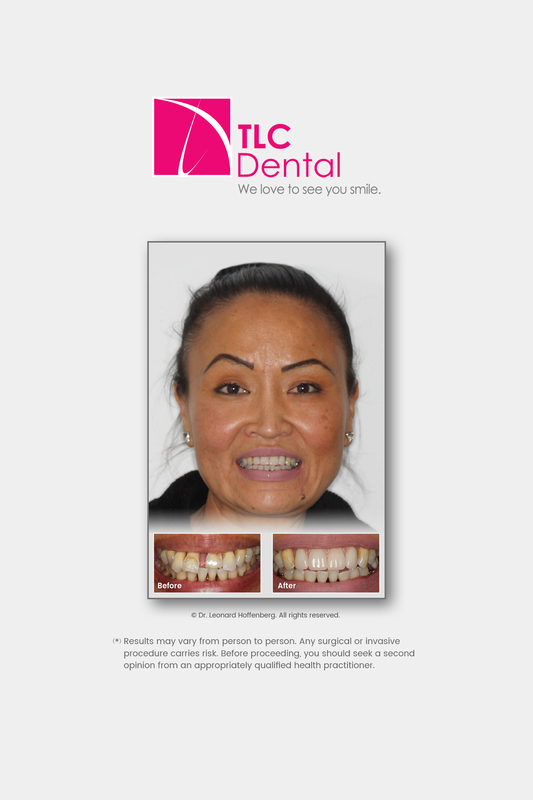 This patient is a beautiful confident woman who hated her brown front twisted tooth and hence her smile. Treatment involved teeth whitening followed by 6 Porcelain / Ceramic Veneers. To create the “perfect” smile for her, her new teeth were first shown to her on a wax model. This enabled us to make subtle changes to the shape of the teeth until she was happy and then the expert dental technician made her final Veneers by copying this wax model. This outgoing female middle aged patient hated her worn, dark discoloured teeth, which caused her severe embarrassment and stopped her from smiling. She was also missing teeth in the back of her mouth which hampered her eating ability. All this made her look a lot older. Treatment included gum recontouring to lengthen her teeth, Porcelain Crowns on all of her upper teeth, and a precision fitting partial denture (no clips showing). What is very important in this treatment is that her new teeth colour was chosen carefully to make her feel and look younger, not to give her unnaturally 20 year old bright white teeth. *Results may vary from person to person. Any surgical or invasive procedure carries risk. Before proceeding, you should seek a second opinion from an appropriately qualified health practitioner. From the moment you walk in, TLC Dental will change your image of dental services. 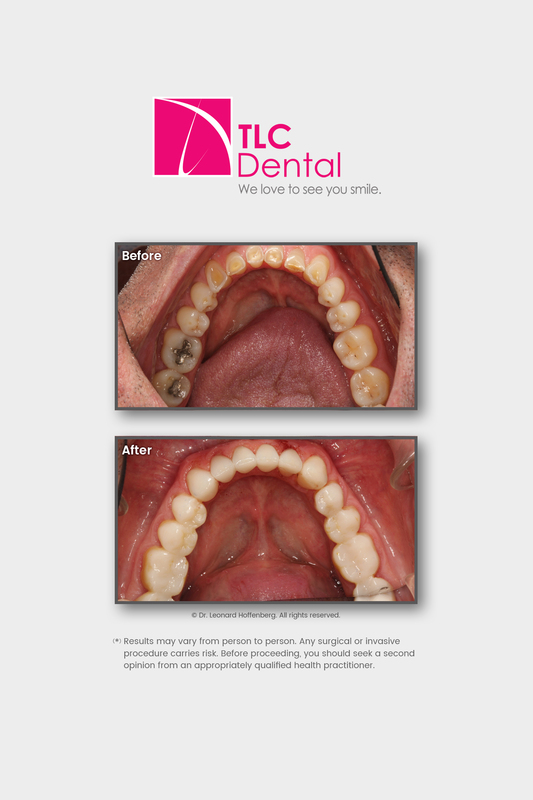 What a difference TLC Dental makes!